Measuring scheduling costs accurately and in a timely fashion. Identification of cost over-runs, improved control of variables, re-validation of crewing levels and enhanced schedule planning. 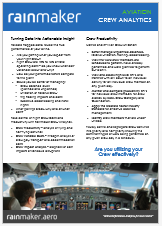 If you would like to view a demonstration of Crew Analytics then please submit your contact details on the request page.